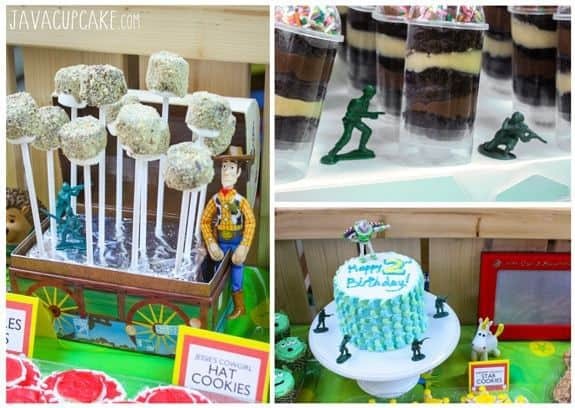 Woody, Buzz and the gang come together in this easy, fun Toy Story themed dessert party that anyone can put together! My son Matthew celebrated his 2nd birthday this past weekend and I put together the most elaborate dessert table I’ve ever done! Now… don’t let that scare you from putting one together yourself! All it took was a little planning, time management and help from friends to collect Toy Story props! 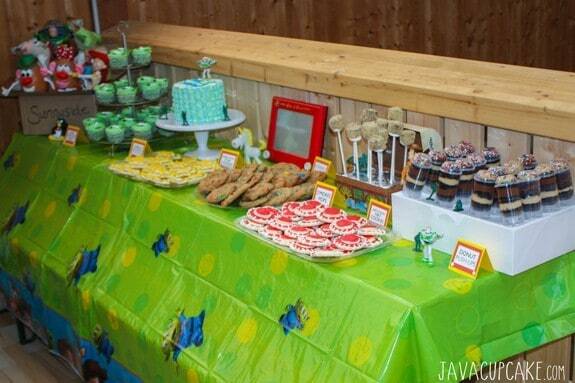 For the next two weeks, I’ll be sharing with you the details of everything you see on this Toy Story Party Dessert Table… including the decorations, props and food with recipes too! The only money I spent on this display table was the food. Seriously. I didn’t spend a dime on the decorations. A few months before the party, I enlisted the help of my friends to keep their eye out for FREE Toy Story themed toys and party supplies. 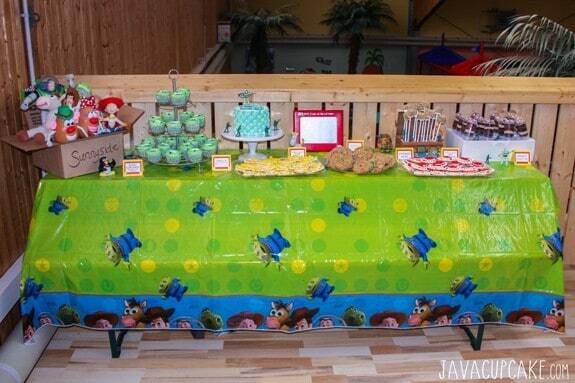 To set the theme of the dessert table, I started with a disposable Toy Story plastic table cover. I chose this because the party was at a public place and I wanted easy clean up. If I were having the party at home, I would have used a table linen in blue or green. So… what’s on the table? Let’s start first with the main centerpiece of the table… the box of toys! I absolutely loved this part of the table because it really brought the entire theme of the party together. 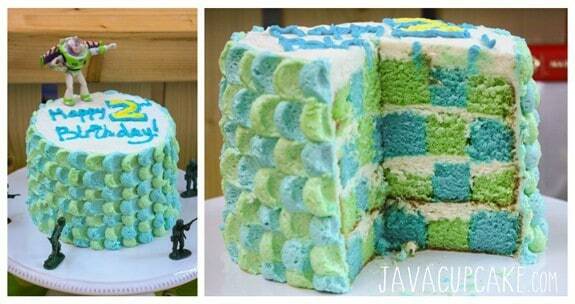 Best part… so simple to make! Medium/large cardboard box with no writing on the outside. With the black sharpie, write “Sunnyside” on the side of the box. Place newspaper or smaller boxes inside your box to add height to the toys. Arrange the toys so they appear to be coming out of the box. The front flap of my box was slightly too long and was getting in the way of the display aspect of the box, so I cut in down about half. This step is optional. Of course, all the desserts on the table needed to have food signs to go with them. I looked online for some on ETSY, but I just wasn’t in love with anything I saw, so I decided to make them myself. “Etch” was the perfect shape for the signs. Rectangle with a large space in the center, plus it was super easy to make! 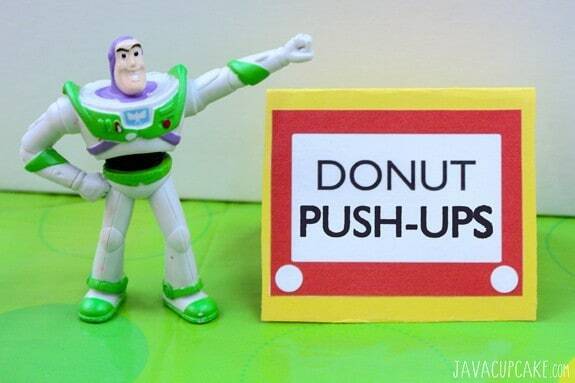 So easy… that I’ve made a blank template for you to download and use at your Toy Story Party too! Just click the link below to download! Hide green Army Men around the table as if they were on a recon mission. Toy Story DVD box in the shape of Andy’s toy box was used to hold the s’mores pops. Small Woody doll sat in the toy box. Etch-A-Sketch sat against the wall behind a plate of cookies. Unicorn, Mr. Pricklepuss, Buzz and Wheezy filled in the gaps of space on the table. Buzz was used as a cake topper. Over the next two weeks, I’ll be posting recipes for all the desserts I made, so in this post I’ll just be sharing with you what I made. 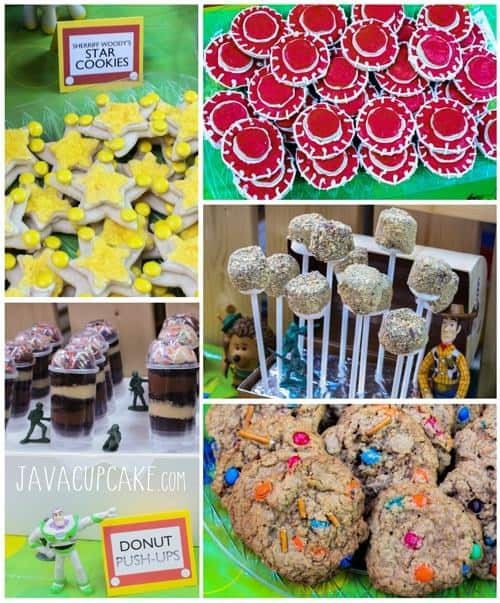 NOTE: Click on the links above to find recipes and tutorials for making some of the other desserts in this Toy Story Party! Overall, this dessert table was a huge success. I’m so very proud of how it turned out. 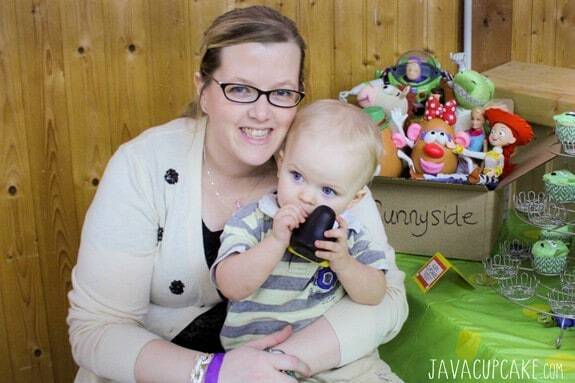 You might remember last year I put together a Sesame Street party for Matty’s 1st birthday… which was great! The cupcakes turned out amazing and I put out a few themed snacks. But it was NOTHING like this years party! Here’s me an my little man at his party. He had so much fun playing and eating his desserts! Actually… everyone at the party loved it. I look at the pictures and am still in awe of what I created! My hope is that by the end of this Toy Story Party series… you will feel confident to recreate some of my desserts and decoration ideas yourself! It just takes some planning, reparation and help from a few friends… but none of it was really “hard” to do! 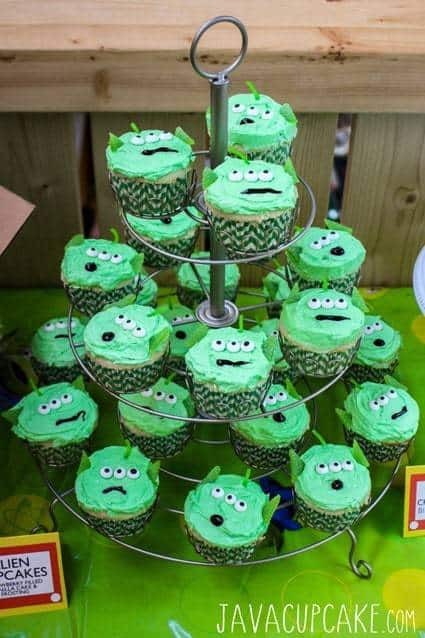 So… until next year’s party… I hope you enjoy the upcoming recipes & tutorials for this Toy Story Party! Please PIN this image below to share with your friends or save the ideas for later! Love all of these ideas! I’m rarely creative with this kind of stuff. This looks fantastic! OMG I loooove it! You did such an amazing job!!! I’m sure your little guy had such a blast! All these little details are so great Betsy!! 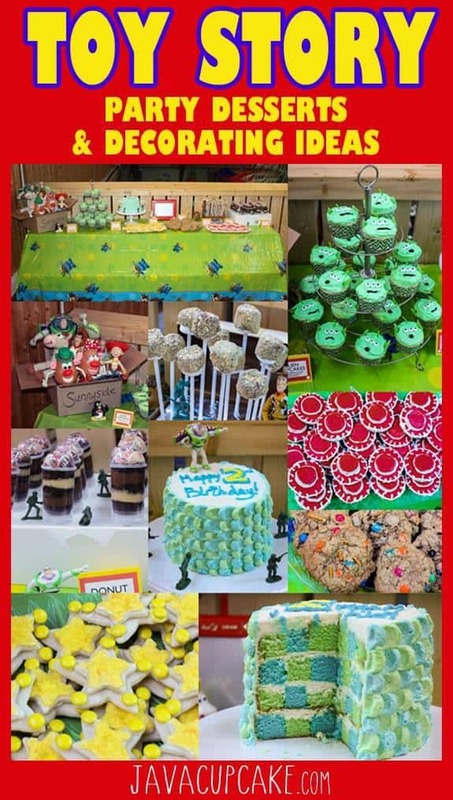 The little hat cookies and cupcakes and army men — so great! Happy Birthday to your little guy! This is such an amazing party Betsy!!! I love all the details. 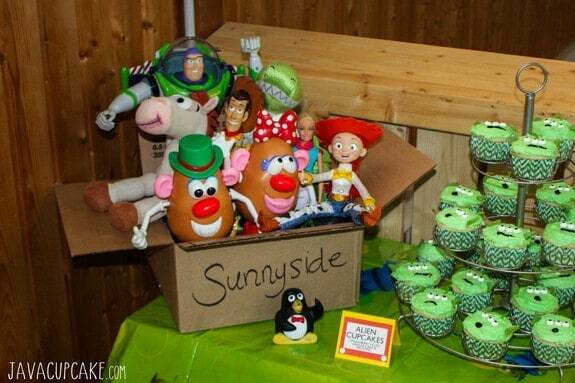 I want a Toy Story Party!! I love it! I just bookmarked it for future reference when I throw ToyStory party theme! Wonderful! Send me pictures if you make anything! oh will do!! Thanks again!